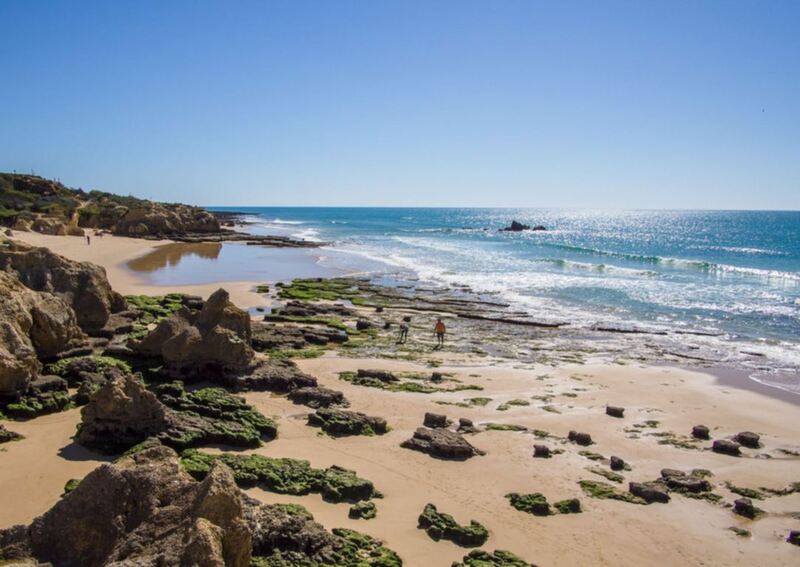 Praia da Galé is a hidden treasure near the town of Albufeira. 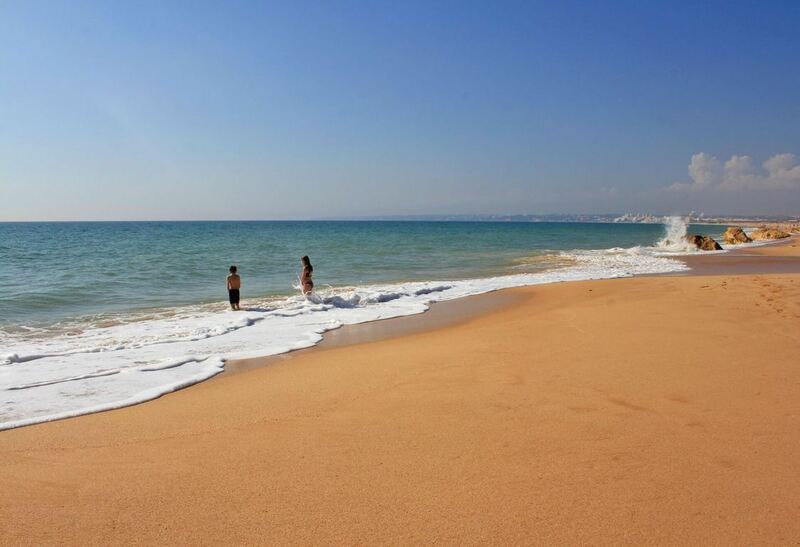 This beautiful golden beach is 4 kilometres west of Albufeira, and is located between Albufeira and Armação de Pêra. Although there are many restaurants and facilities nearby, the beach still has a sort of an undeveloped feel. 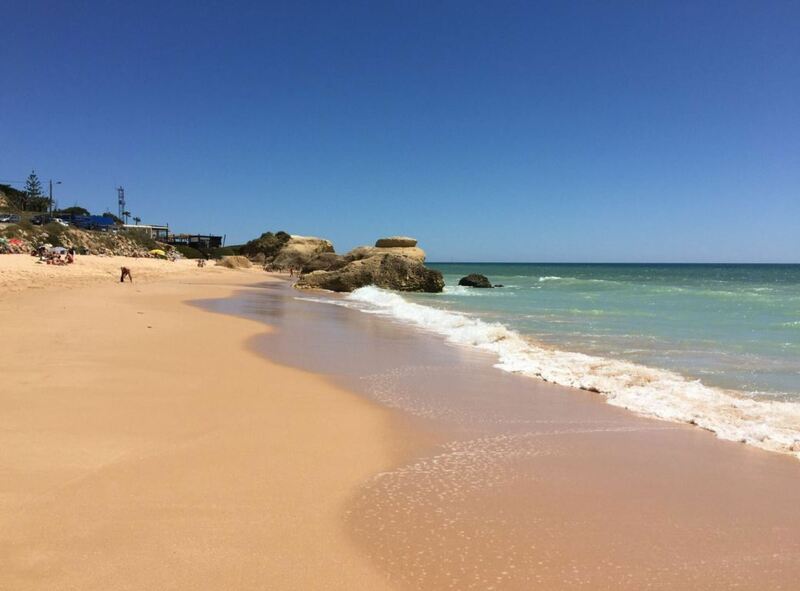 The beach is a pleasant escape from the crowded beaches near Albufeira. 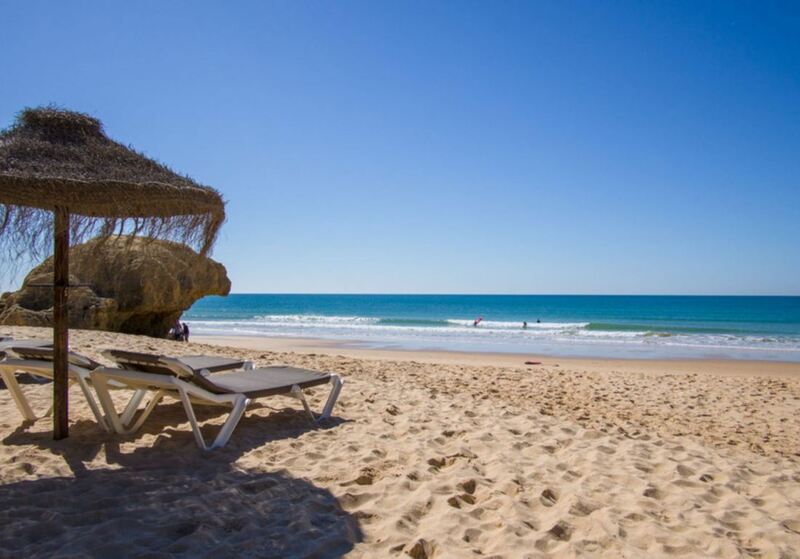 Praia da Galé has been highly rated by TripAdvisor. Just reading the reviews will make you want to go visit this beach as soon as possible. 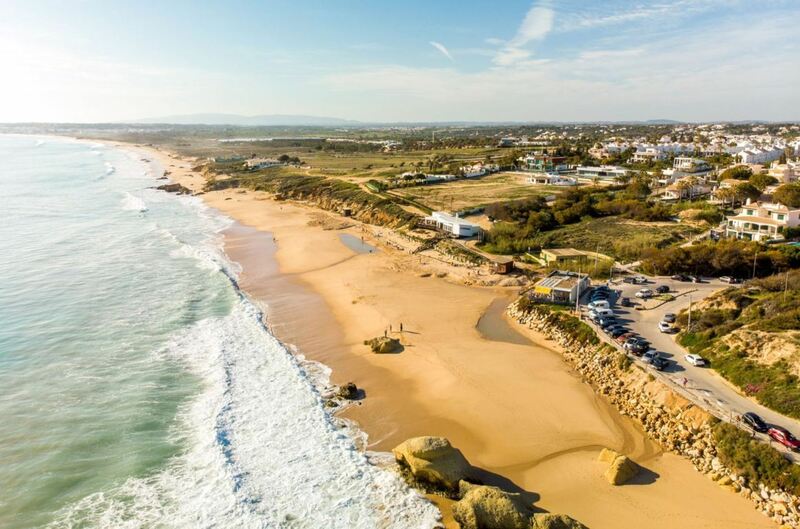 To get an impression of Praia da Galé and its surroundings, watch this stunning video. As you can see, the golden beach is surrounded by beautiful dunes and nature. 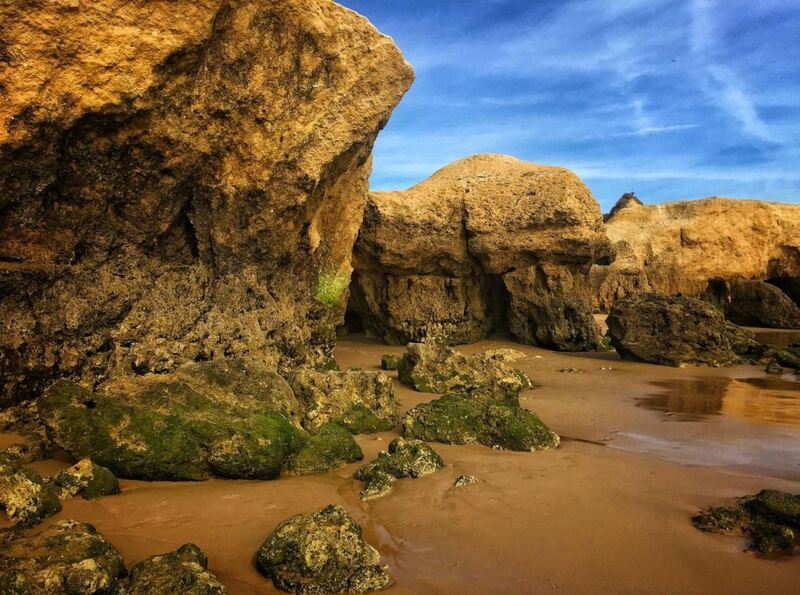 The beach has soft sand and is surrounded by a beautiful scenery, consisting of rock formations and nature. Viewing the sunset from Praia da Galé is stunning. The beach is also very clean. During the summer, the beach is supervised by several lifeguards. The water is clear, but can be a bit cold. Be aware that the current can be strong at times. There can be nice waves, especially on the west side. It is a blue flag beach. The beach is very popular among Portuguese people in the summer. The beach actualy consists of an eastern (leste) and western (oeste) part. The western part of the beach is wide and open, while the eastern side of the beach is more narrow and is characterized by rock formations. The east side (which is on the left hand’s side if you are looking towards the sea) is characterized by rocks. You can find many fossils in the rocks. On this side of the beach, the sea is quite shallow and there are natural pools in the water, in between the rocks. This makes this part of the beach especially suitable for families with young children. On the eastern side of the beach you can also visit caves. The west side of Praia da Galé stretches out for several kilometers. This makes this part of the beach great for long walks along the sea. You can walk all the way to praia de Armação de Pêra. To walk there, walk to your right (when looking at the sea). Although it is one stretch of beach, you will come across several different beaches along the way. First you will encounter Praia dos Salgados, then Praia Grande de Pêra and finally the beach of Armação de Pêra. On the west side of Praia da Galé you can also practise many water sports, like surfing or jet skiing. There are several beach bars and restaurants on the beach, so you could have a little stop on the way. You can also hire sunbeds here. Be aware that the beach directly in front of the restaurants is more crowded. If you want a bit more space, avoid sitting directly in front of a restaurant. It is possible to experience this beach right now, with a 360 degree picture. After you park your car, there is a long boardwalk that takes you to Praia da Galé. The boardwalk takes you through the dunes. The dunes in front of the beach are environmentally protected. The west part of the beach is also great for walking through the dunes and its swamps. You will see many different plants and birds here. You can easily spend 2 or 3 hours walking through the dunes here. This walk is easy to do and well recommended. 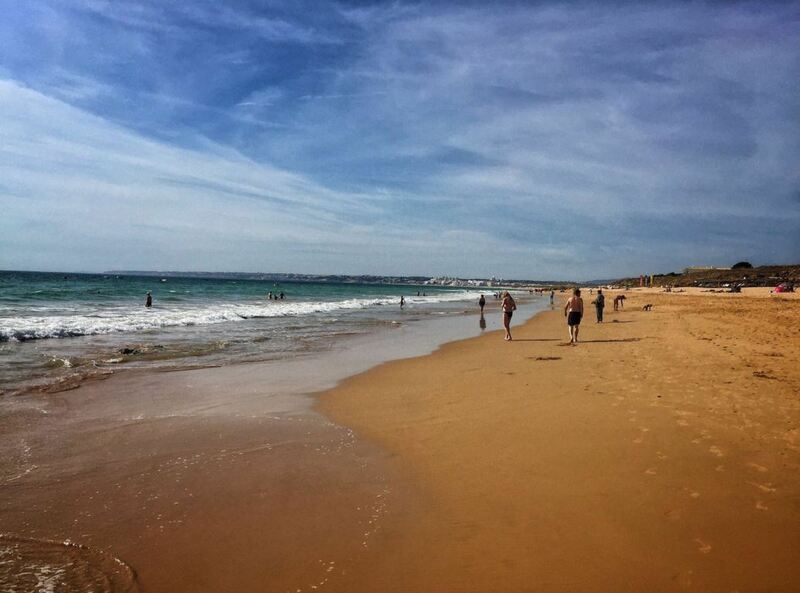 To get to Praia da Galé, you can enter the following address in your GPS: Estrada da Galé, Albufeira. Beware that parking near the beach can be difficult, especially during the high season. To increase your chances of parking near the beach, make sure to arrive early. After you park your car, you walk along a wooden path through the dunes, towards the beach. Near the entrance of the beach, you will find a local woman selling delicious fresh fruits. Excursions are a great way to spice up your holidays and make them extra memorable. Near Albufeira there are many excursions you can take. For example, what about seeing the coastline of the Algarve by boat? Below you can see our selection of recommended excursions nearby. Bellavita. This Italian restaurant has good food and is reasonably priced. The staff is always very welcoming. Mr Singh. This Indian restaurant is one of the best curry houses in the area. The food is great and lovers of spicy food will not be disappointed. Restaurant Vila Joya. This world-class restaurant is for people who want nothing but the nicest food. The restaurant has two Michelin stars. It offers a six-course menu that changes daily. 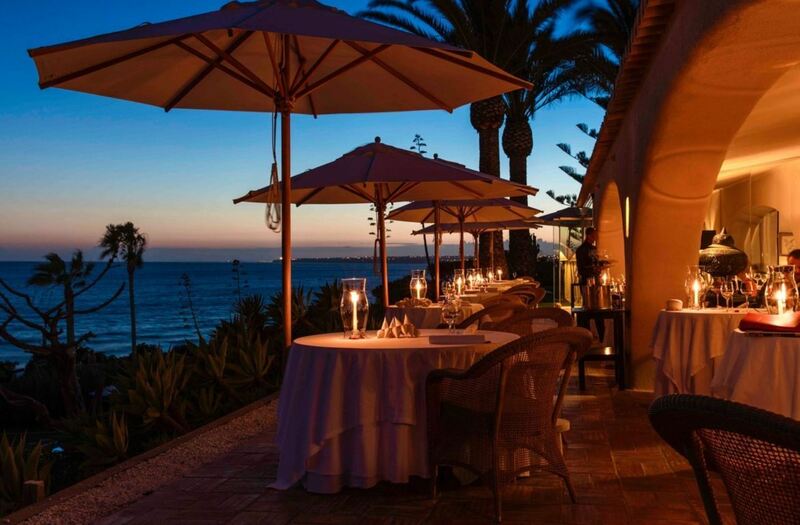 Its famous chef, Dieter Koschina, will make sure you will not forget this dining experience. Vila Joya. This 5 star resort sits right above the beach, which is a great location. There are several swimming pools and wellness facilities. Moreover, the hotel houses a 2 star Michelin restaurant. 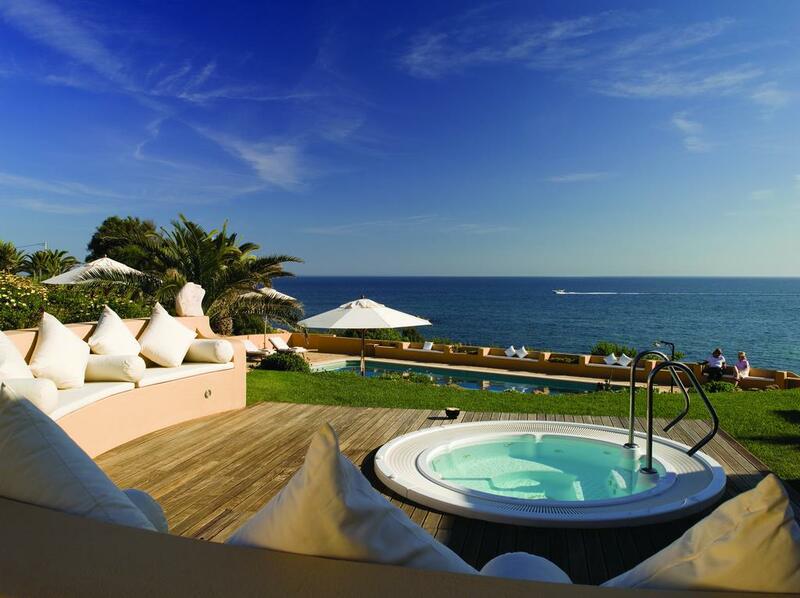 It is one of the most exclusive hotels of the Algarve. Vila Gale Collection Praia. This 4 star hotel has a nice swimming pool outside, surrounded by a big terrace. Guests can enjoy the wellness facilities of the hotel, including a fitness centre. The hotel also offers several indoor and outdoor activities. Highly rated. Apartamentos Debimar. This apartment is within walking distance from the beach and a supermarket. It basically offers everything you need for a great holiday in the Algarve. After the busy summer season of last year, we recommend to book your hotel now, as it will probably sell out. Below you can find a map with the location of hotels near Praia da Galé. By changing the date of your holiday, the map will show you the current prices. The area around the beach is relatively peaceful, compared to Albufeira. 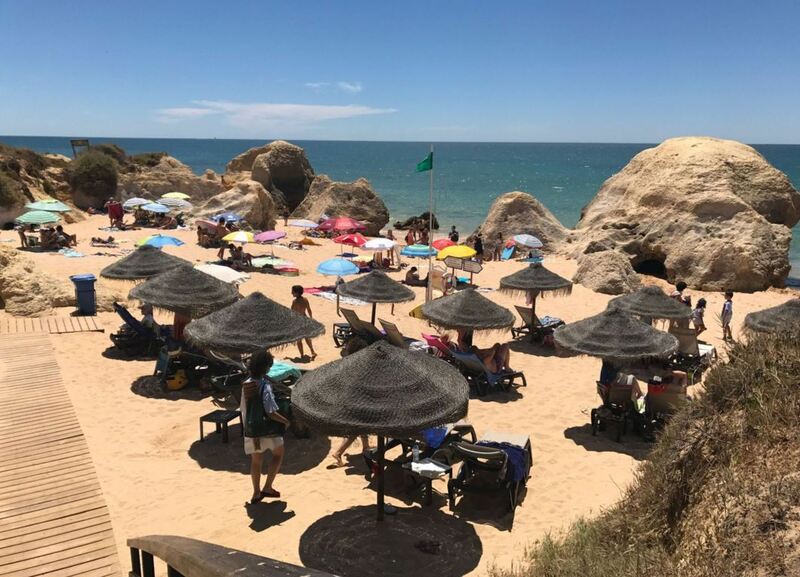 However, many people visit the beach during the day, while in the evening they enjoy themselves in a restaurant in nearby Albufeira. The beach is easily accessible, also for people in a wheelchair.